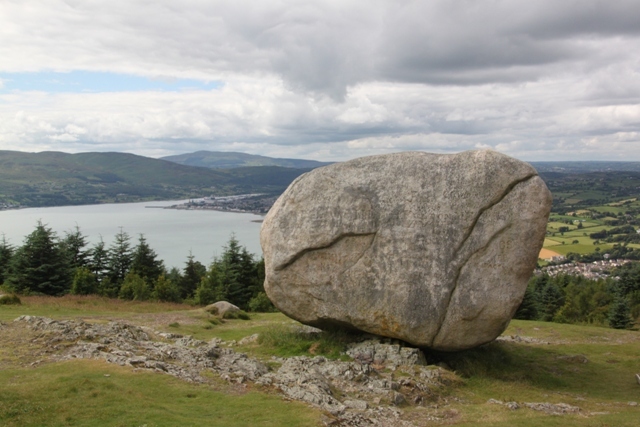 Cloughmore, or the Big Stone as the locals call it is a 30 tonne granite boulder perched on the slopes of Slieve Meen in Co. Down, one thousand feet above the village of Rostrevor. This is one of those places I wonder why we haven’t visited before, so blown away were we by the scenery we are desperate to go back already. 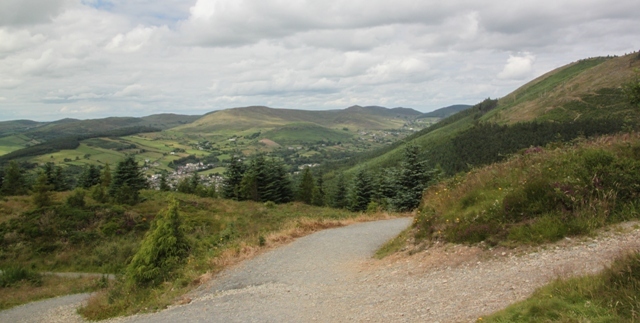 There are two choices to get to the Big Stone – a long, hard, steep and tough climb or a shorter, very steep and very intense climb – neither is the easy option but the rewards are great. We went for the latter, found not many people at all on the track and huffed and puffed our way to the top. 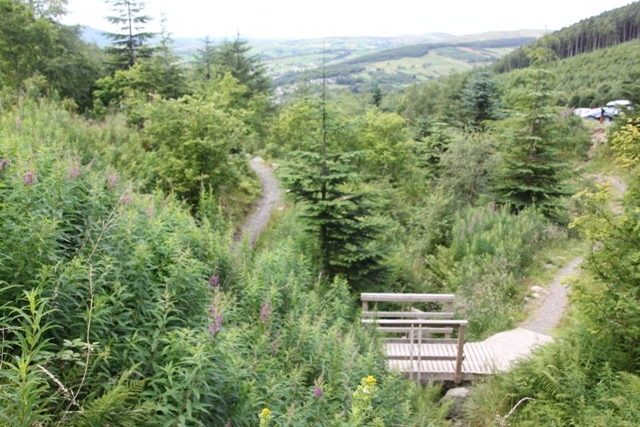 Gorgeous views, trees and steep paths, the vistas were superb. 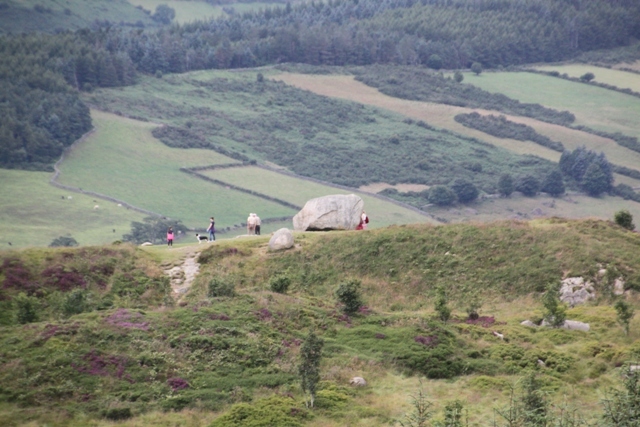 Much puffing and red sweaty faces until we were rewarded with the Big Stone in all its glory. 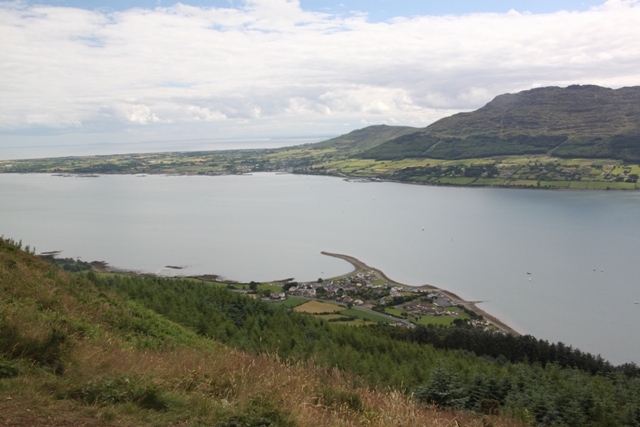 Pretty impressive but so is the view from the top – all the way across Counties Louth, Armagh and Down and the stunning Carlingford Lough. 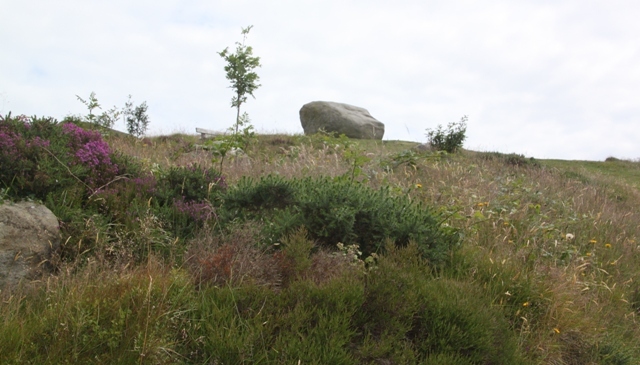 The stone was deposited here by retreating glaciers during the last Ice Age but I prefer the local legend. 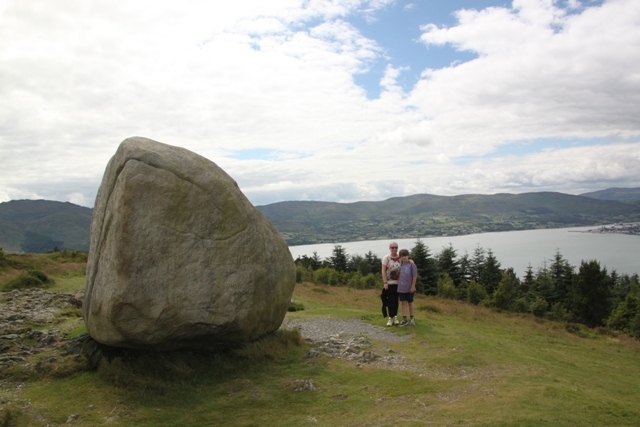 The story goes that it was thrown by a giant from the Cooley Mountains on the other side of Carlingford Lough and landed in this spot. Apparently walking around the stone seven times will bring good luck. Out of puff and then swept away by the panorama we forgot to try this out. Husband wandered, Son and I sat by the stone catching our breath and drinking in those views. When the wanderer returned we walked with him along one of the many paths. A few families around and about picking blueberries by the bucket load. We had a try of some ourselves. Growing in abundance at the top I can vouch for their deliciousness. We had planned to hike to Fiddlers Green, a well known clearing in the woods where they hold a music festival later in the summer. We missed the track and found ourselves heading off in the wrong direction. 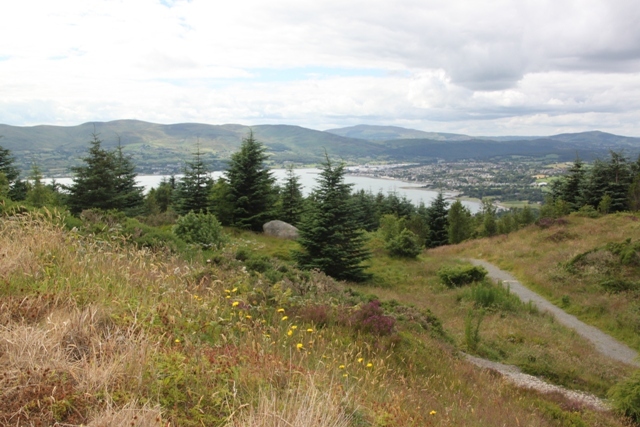 Serendipity – the track took us through a forest dark as night but when we emerged blinking into the sunlight, the most glorious view of the whole lough spread out before us. 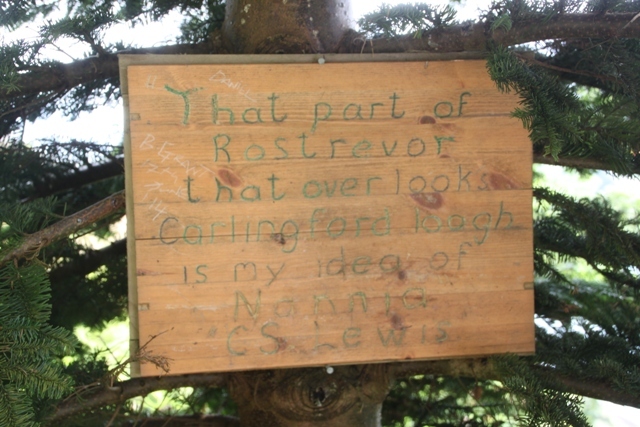 Just a little way further along, the track finished right by a sign claiming the view was CS Lewis’ inspiration for Narnia – not hard to see why. Retracing our steps we still failed to find Fiddlers Green on the descent. It didn’t matter though, we can see it another time. We will definitely be back here. I love that the choice is steep – or steep! The rewards seem to have been worth it though. It was so steep Anabel – the more intense option worked for us, I don’t like dragging pain and suffering out for too long!! It was most definitely worth it though, such a beautiful place and so much to explore, we loved it. Me neither! I always prefer going up the steeper, more direct route, and coming down the less steep one if that’s possible. Steep descent puts so much pressure on the old knees. Something special isn’t it Erika, the views are just divine. 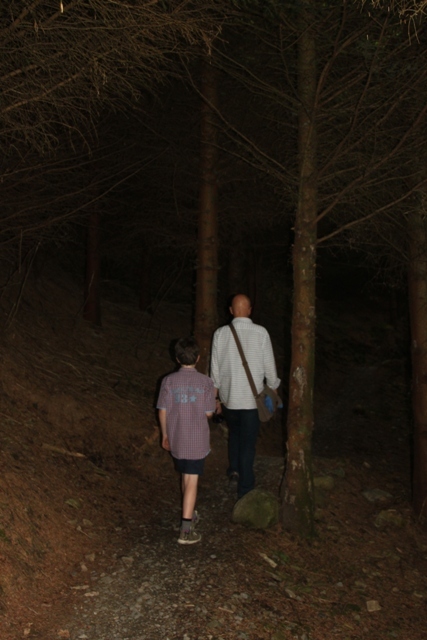 The forest was freaky too – luckily we weren’t in there for too long and didn’t spot any Irish monsters!! The views do look spectacular. They would have to be to make that steep trek worthwhile. What is it about the Irish and Scots and their stories of giants? Every large rock was chucked by a giant it seems. Wobbly legs at the top for sure, but definitely worth it. I suppose the giants livened things up in days of old!! Thank you Jacob, it’s a stunning spot. Wow….and to think that pictures never really do scenery the kind of justice it deserves makes this even more impressive. I love the story of the Giants and walking around the stone. I’m always curious how those old tales begin. Steep and steeper, huh. Such choices…:) I’ve would have picked your route also, for the same reason. Great visit. Thanks again for sharing. 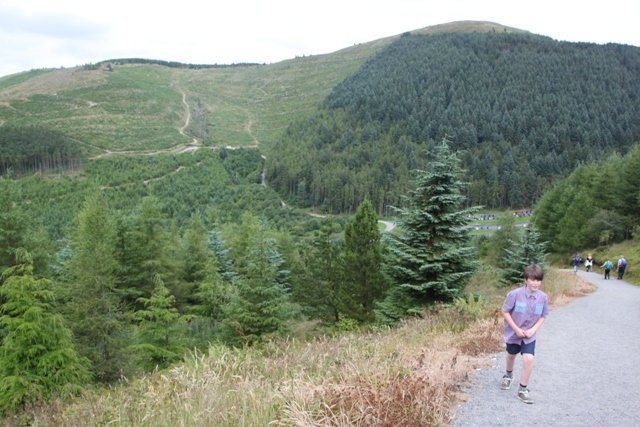 Thanks George – as you can see those views make a steep or steeper climb well worth it. You’re right too, it is even better when you see it for real. Any story with a giant does it for me!! Thanks for coming along! What breathtaking views! Love it. Thanks Dee, it’s a gorgeous place, like I said we can’t wait to go back sometime, even despite that steep and painful climb! Definitely Pam – wobbly legs and red faces all round after all that exertion but it was incredibly worthwhile. The view was amazing and so beautiful. What a gorgeous day. 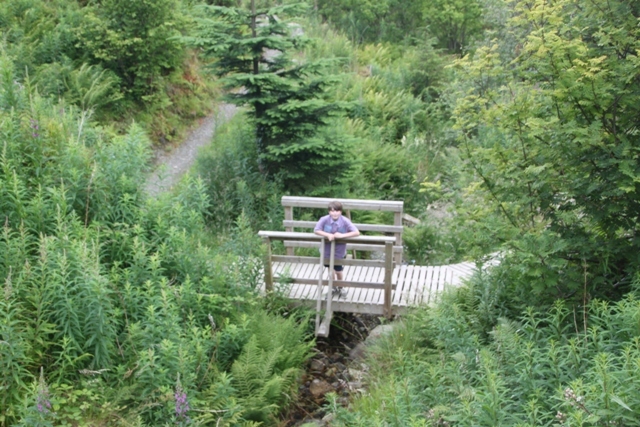 It’s the perfect place for so many of us who wish we could just walk into Narnia… As the weather gets warmer and the days longer we are looking forward to adventuring outdoors more…you are inspiring us! It did feel like we’d walked into Narnia – a special place for sure. We are loving the longer and warmer days here too – spring is such a wonderful time of year! Oh I love the Giants Causeway too Lynda – wonderful scenery along that coastline as well. I think (not 100% sure) that the legend for here and the Giants Causeway both involve Finn McCool – one busy giant!! Finn McCool?? What a great name! ha! Stunning views! Good thing there were blueberries at the top, it sounds like a rough hike. I think a Belgian beer would have gone a treat!! The blueberries were good though…. Beautiful. Looks like my backyard. 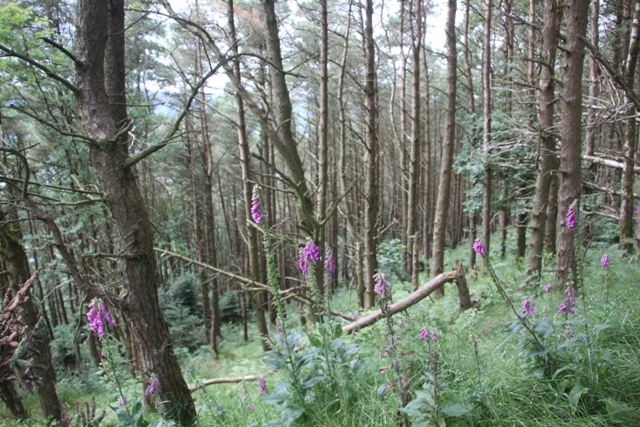 The fireweed, I’ve not seen that since the Arctic. 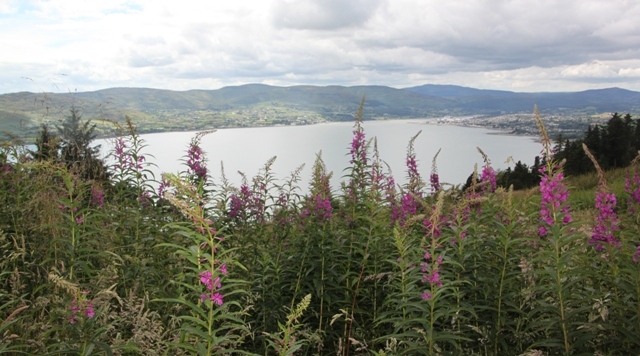 I love that plant – the colours are stunning – just like the view!! Looks like Narnia to me! Thanks for sharing. 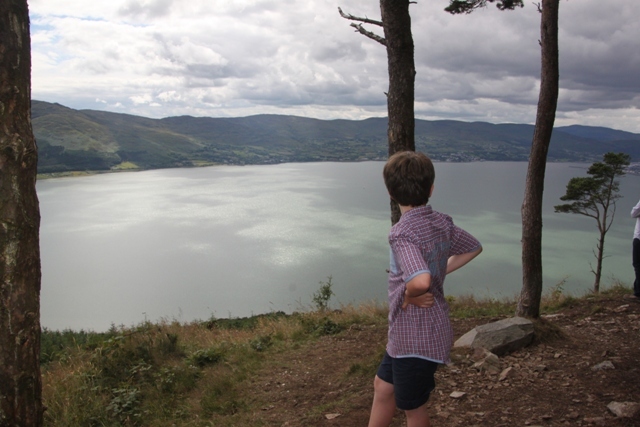 It is pretty magical – you can see where the Narnia inspiration came from for sure! We will be back and will try out the walking thing!! I love the legends about rocks like this too, makes the whole place seem even more magical! And what a view !! wow !! I love that view – just stunning. All the pain and puffing was forgotten about as soon as we reached the top – I would even do it again so that says it all! Ha ha – mine too!! I spend far too much time lusting over new destinations on other people’s blogs on WordPress – mine is out of control!! Thanks Lucy – it’s a gorgeous place, hope your day is a great one too! I’m glad I didn’t think about the Blair Witch thing before I went into that forest Diana – phew – too easily freaked out, I may have chosen a different route!! An amazing day of hiking! I like the idea that Narnia actually exists somewhere. Does the local legend tell why the giant threw the big stone? Apparently he was having an altercation with another giant!! 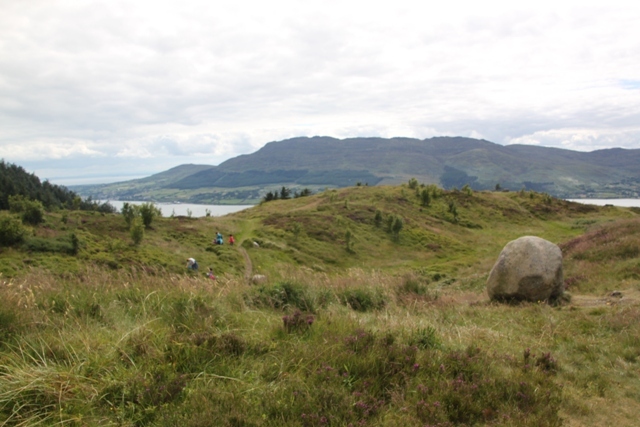 He threw this rock from the other side of the Lough to try and hit his enemy – how the legend explains this rock being the same geological material as the mountains on the other side. Good isn’t it – I like these kinds of stories! Sometimes those “mistake” paths prove to be some of the most interesting, don’t they? It looks like a wonderful place. 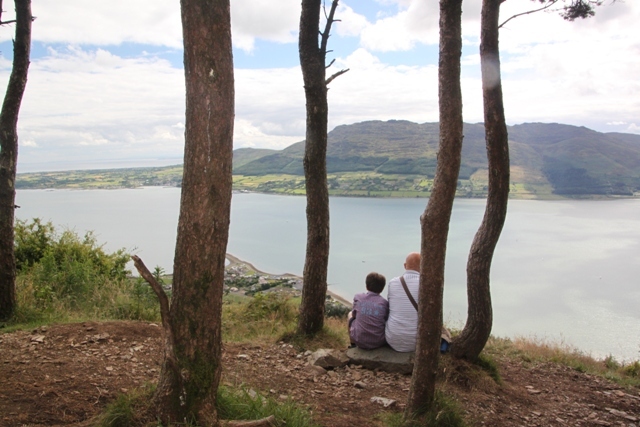 Definitely – this one was like that – such a treat at the end, we were blown away by the views! Completely agree – if you go off the beaten track just a little there are some amazing places that don’t get very much publicity or tourists!! This place is gorgeous – you should definitely visit!! It is a gorgeous and special place Ana. The legends give the whole place a magical feeling – we loved that. It is gorgeous – and varied too! This is one of my favourite places Rosemary – I think the legend with the giant combined with the scenery make it just magical. The hike and sweating are all forgotten about as soon as you get to the top!